Kevin Jackson is a 39 year old writer from Northern Saskatchewan. He's been jotting notes and story ideas for over twenty years and has an old shoe box filled with sketches, drafts, and inspirational quotes. Brainstorming has never been the issue for him! Currently, he's working on two different trilogies and associated writings. He enjoys writing poems and short stories and is also quite the hobby enthusiast which might be what keeps him from getting the larger projects done. 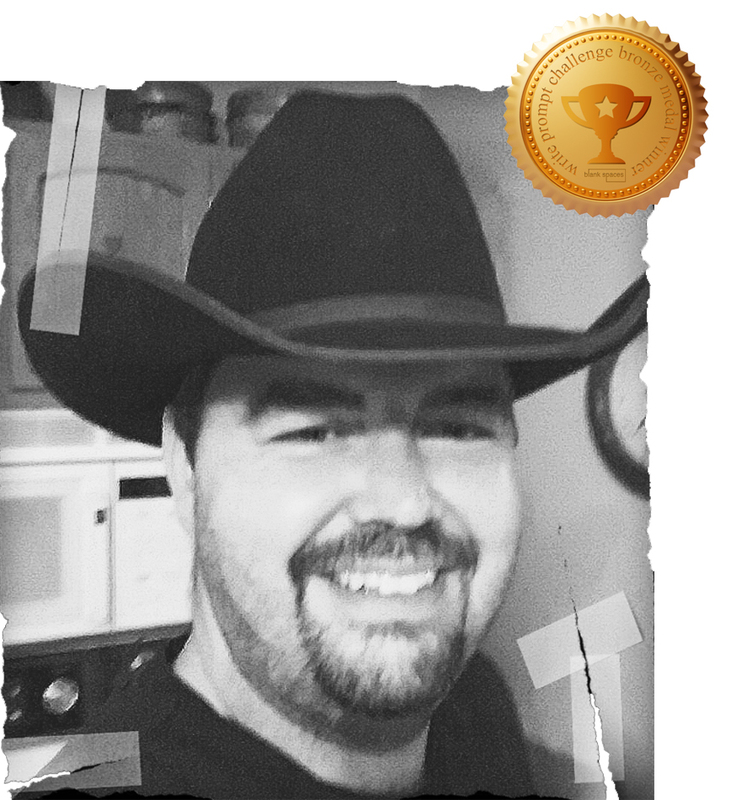 When we contacted Kevin to reveal his medal standing in the Flash Fiction Contest he responded with humility, saying, "I’m excited to find out that I placed at all in the flash fiction write prompt challenge. I wrote and submitted the story only for fun." Well Kevin, we're glad you did and hope it inspires you with a little push to keep chasing after those writing dreams! "Confusing at first but it's clear the story pivots on the twist ending. Interesting interpretation!" "There was a wonderfully natural flow in this story that allowed the read to be enjoyable and engaging. Intention and plot were clear and the written images spoke well of the character in the photo." “As with every superhero story, it all began with a series of curious events and a woman. A red haired woman in a quaint café to be specific. She was dressed in all black, from her small feathered hat to her pointed heels. She sat alone, watching the street, eyes moving back and forth as she stirred a strange pink liquid with a straw. I approached her with a soft greeting, her eyes fixed upon me and she smiled. She invited me to sit with her and I obliged, seating myself on the bench beside her. “She spoke in a foreign language but her eyes and the language of her body were easy to understand. She wondered if I was hungry, and I yipped a confident, ‘Yes!’ Roaming was hungry work and it was well past lunch time. “She laughed and stroked my cheek and ran her fingers through my hair. Her order arrived shortly. A nice eggy truffle for her and a small spiced loaf of meat for me. We ate and she spoke her strange language. I watched her eyes with curiosity. 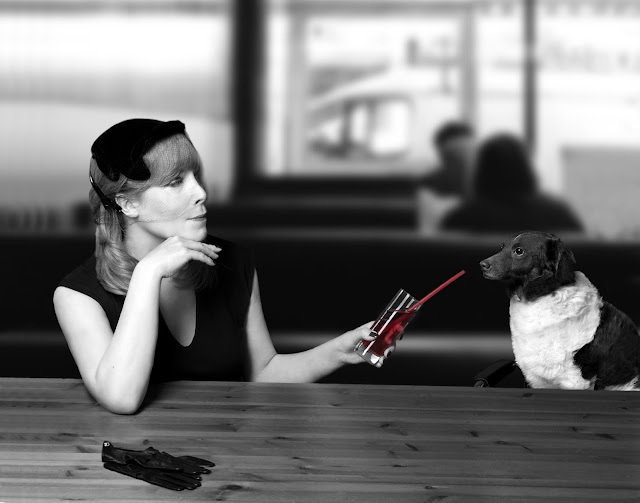 She presented me with a glass of pink liquid, a schooner half empty, with a white straw sticking out. She held it up to my nose for inspection. “The smell set fire to my nostrils, and my mouth watered as my mind tried to place the scent. What was it? With no regard I lunged at the schooner. “It started small, and before long my heart beat its drum intensely in my ears. My vision sharpened to a razor’s edge. I felt as though my skin was tightening. My muscles suddenly filled with strength. I jumped from the seat and ran away down the street, away from the woman in black, unsure what to do with myself. What had she done to me? “I ran down the avenue toward the train station. In moments I was coming alongside a speeding blue and red train. I tried with all my effort to run faster than the train. If only somehow I could get to the safety of the other side, I could leave the woman in black behind forever. “I had never outrun a speeding train before, and my muscles pulsed and flexed with ease. Perhaps it was an effect of the pink drink… come to think of it, why did that train have a white face? “Anyways, I continued to run, and it came so easy. My muscles were powerful and strong and then I saw it. A nice house with a red corvette in the driveway. The commonplace two story home was a split design, though oddly this house was split vertically rather than horizontally. “It should be easy enough, I challenged… and then I leapt. As I cleared the peak of the house, soaring in the air, I glanced down to see a generic looking couple; the woman blonde and the man brunette. They gasped in shock as the neighborhood’s newest superhero bound off in unhuman leaps as I continued down the block. I was off to find a nemesis worthy of my valour. I heard it then, an alarm, a shriek in that foreign language. “I ran with all my might around the wrought iron fence, down the block several meters and around the concrete grassy embankment to the front of the local jewelry store. I saw a man there with a gun, pointing at the people, he waved his arms frantically. He was shouting in his language. I shouted back to him that everything was going to be alright, that he should surrender, and that it’s not worth the danger. I repeated myself about twenty times but he did not understand." “The police arrived and surrounded the building. It was a standoff and many bystanders had gathered around the sides of the adjoining buildings down both sides of the block. “The Policeman in charge was speaking over his large speaker and the two yelled back and forth for a few minutes. The jewel thief made threatening gestures with his gun towards one of the hostages. It was time to act! Without hesitation, I bound from my hiding place, darted across the parking lot and leapt at the bad man. Aiming for his arm and the weapon in it, I used all my might and gripped down on his wrist. He yowled in pain, a language anyone can understand. “The jewel thief was unarmed; in a flash the police were on the man. “Well, my boy, that’s why I brought you here. They have it. They have a lot of it. Stored in bottles. If only we could get our paws it, we could be super again! My attempt at playful suspense and comedic timing culminated in a simple story of a dog trying to find his next sugar buzz. Unwittingly, he connects the effects of a pink liquid drink with the spontaneous development of super powers and adventure ensues. I’ve added some non-specific jokes within the text to see if readers catch them, attempting to keep the reader from realizing the spoken words are from one dog to another. Although I’m an amateur author, I’m attempting to get over the hurdle of shyness when it comes to presenting my work. Small projects such as this build momentum for my larger works. Use the comments below to encourage Kevin in his writing journey! Congratulations Kevin! Your entry was playful and entertaining. I loved the surprise when the voice of the pup appears, as well as the effect the potion had on the dad in 'his' version of events; giving him those unhuman leaps and bounds, and turning him 'super' in the eyes of his son. A great story, so keep writing.